For the prototype I currently use some assets from the tropical island demo provided with the Unity game engine. 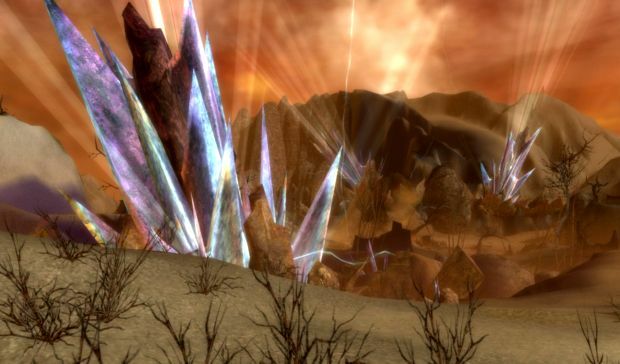 My plan for the environment of the islands is something similar to what you can see below, but with colders colors (screenshot from Old Ascallon, Guildwars). I would like something very "crystalline". yes, but map should be "iceline"
What you're refering to pat? Maybe some sort of.. uh... Fallout 3 enviroment like? Or you're really refering to colder in the meaning of.. let's put that island on North or South (extremes)? What you're refering to pat? ... colder in the meaning of..
cold color (definition): Family of colors with a bluish tinge, such as blue, turquoise, or green. The opposite is hot colors such as red or orange. Thinking on a Forest (green like) or... more like.. uh... a desolate place?